"Celebrate a evening of Self love on this special Valentines Day". Join us and learn simple loving Breathe techniques with body movement to expand the positive qualities of your Heart ~ Love, Joy, Compassion & Gratitude. 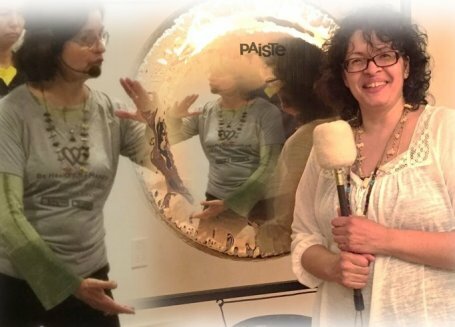 We will end the session by coming to stillness and soaking in the healing vibrations of the deep, rich gongs in a more traditional gong bath. You'll leave feeling balanced, grounded and peaceful…and more in love with your own precious Heart. Door open at 6:45 until 7:00 pm afterwards lobby doors close. Judith "Grasshopper" is a certified Karuna Reiki Master Teacher, Shamanic and Crystal Practitioner offering certification programs in various levels of Reiki Healing. Initiated and an Indigenous MedicineWay Practitioner, Completed program at NY Open Center under Integrative Sound and Music Practitioner training. Completed a Sound and Sonotherapy program at Sage Academy of Sound Energy. Gong Master Certification. LinDel Sandlin has been avidly practicing Tai Chi and Qigong meditation for almost 30 years. She's been teaching them for over 5 years in various places on Manhattan's Upper West Side. She's a certified instructor in the Universal Healing Tao system created by Grandmaster Mantak Chia. LinDel is also certified in the earth-based energy healing modalities of Crystal Healings, Sound Healings (Chakra tuning forks) and Shamanic Energy practices.